This entry was posted in Tilly and the Buttons and tagged Coco, Dresses, Sewing, Tilly and the Buttons by Joanne. Bookmark the permalink. Love it! You look amazing! And I don’t know if that’s a new haircut or not, but it sure looks cute. Thanks Claire! Not a new haircut but I’ll take that compliment anyways! Such a flattering dress on you – you SHOULD make more of this pattern! All the cocos I’ve seen so far are flattering. It’s a great pattern. Thanks toots! Definitely want to do a top too. Love the idea of a polka dot one with a contrasting peter pan collar. Wonder if Tilly will do a little tute on adding one… Hint hint! So cute and I love your wild print! This looks great on you! I absolutely love you fabric, you’ve inspired me to make up a Coco! Your Coco is so pretty and you look great in it! The part about the needle was scary though. Glad you weren’t hurt. Awesome! One of the best Cocos I’ve seen so far! I’m normally not into animal prints, but this one is great! That is so kind thank you very much! Super super cute on you! You look great in that print. I was making a Coco yesterday for my daughter – it would have only taken me a couple of hours but I was using my overlocker and, when I changed the thread spools to the right colour, I made a mistake and ended up having to re-thread it all which took me an hour (I haven’t had it long!!). Anyway, I also bought my fabric from Tissu and is has Japanese symbols all over it – as I said, it’s not for me! – and after the first fitting, daughter decided she preferred short sleeves so I chopped those off. I was thinking of a funnel neck one for myself and, now I’ve seen yours, I’m definitely going to go for it – it doesn’t look ‘Star Trekky’ at all. Your Coco is gorgeous! I LOVE that fabric, and the funnel neck. I say crack out that overlocker, and the next will only take an hour and a half! Ooh I should shouldn’t I? Lordy I’m scared of it though. I have actually bought an overlocker course on craftsy. I really should dig it out…thank you! I loved yours too Jane especially the buttons. A great way to finish and add something special. Thank you! So chic! Who knew that looking glamorous could be this comfortable? Really like this version and particularly like the drape of your jersey. I see many more jersey dresses in our futures! The dress looks great. Like the ‘Tilly pose’ too! 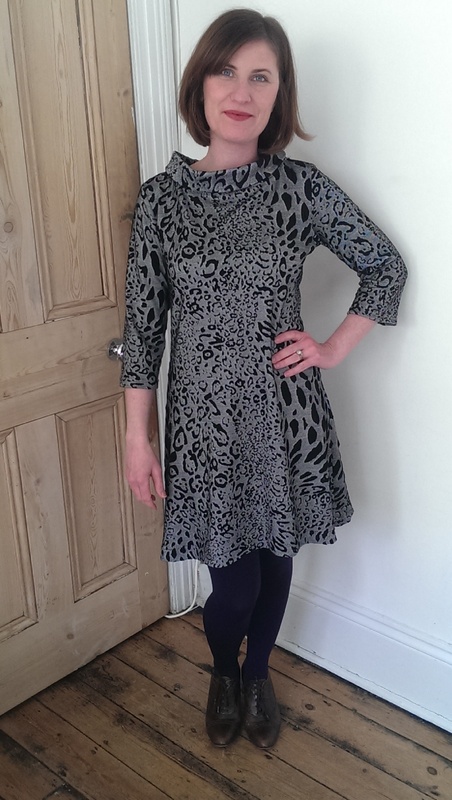 Oooh, in silver leopard print with that funky funnel neckline! It’s so futuristic looking, I love it! Love you Coco! I need to make one! Hey there! You’re looking absolutely wonderful! And what a great dress to send away the sewing funk.